It seems to be working, at least for Microsoft. Putting away the carrots and breaking out the sticks appears to be paying off for Microsoft, at least in raw market share. After pushing Windows 10 onto legions of Windows 7 and 8 PCs as a Recommended update, Windows 10 saw its largest-ever surge in month-to-month usage share in May, according to Net Applications. Windows 10’s usage share jumped by 2.09 percent between April and May, to 17.43 percent overall. That may not sound like much, but it’s a huge leap in such a short time. The only other month that even comes close is January, which saw Windows 10 usage spike by 1.89 percent after the holiday season. The usage shares of Windows 7, 8, and 10 over time, according to Net Applications. A redesigned “Get Windows 10” (GWX) pop-up warns you it’s coming, but many people who were upgraded without consent didn’t notice the change—or that in a nasty trick, Microsoft changed the pop-up’s behavior so that closing the window via the traditional red button in the corner now counts as consent for an upgrade. That’s after Microsoft let you use the same method to decline the constant, annoying GWX dialog boxes that popped up every time you opened or updated your PC for the past six months. It’s like Microsoft suddenly switched the brake and gas pedals around in your car. What’s more, if you leave your Windows 7 or 8 PC on and don’t see the new pop-up, your computer will automatically upgrade to Windows 10 with no action (or consent) on your part whatsoever. So it’s no surprise that Windows 10 usage surged this month. Microsoft’s aggressive new tactics are effectively forcing and tricking people into it. 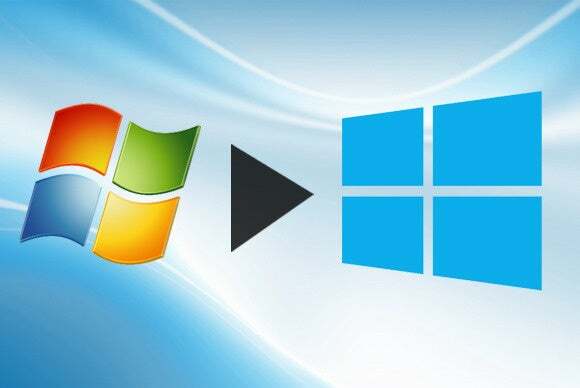 But it’s also no surprise that some Windows 7 and 8 users would rather disable Windows updates entirely than deal with forced upgrades and annoying pop-ups—and that’s dangerous behavior for Microsoft to inspire. Given the effectiveness of the forced upgrade, don’t expect Microsoft to change its behavior anytime soon. The pop-ups will end when the free upgrade offer ends on July 29, Microsoft says. Until then, you can install Never10 or GWX Control Panel to stop the pop-ups and potential non-consensual upgrades without disabling Windows updates. The impact on you at home: Don’t be mistaken: Windows 10 is the best Windows ever, and it’s brimming with all sorts of handy features and underlying system boosts. I use it, love it, and advocate for it. That said, people have very valid reasons to stick with Windows 7 or 8—and pushing a full-blown operating system upgrade on consumers who repeatedly declined already is just plain wrong. If you found yourself in the midst of an unexpected Windows 10 installation, here’s how to abort a scheduled upgrade, and how to roll back to Windows 7 or 8 if your PC already made the jump. If you plan on rolling back to your older operating system, you’ll need to do so within 30 days of upgrading to Windows 10.